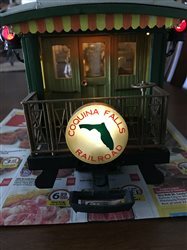 I am creating a ride on train in my backyard but on a strict budget. The tracks are made from PVC conduit pipe and the ties are made from stained garden post wood. Crushed rock acts as the ballast. The distance between the "rails" is about 5.5 inches. I am partially half way with the drive train of the locomotive. The motorized carriage has four lawnmower wheels with 7 inch toilet flanges acting as the wheel flange. The front axle has a sprocket for attaching the roller chain coming from the 24 volt 250 watt scooter motor. 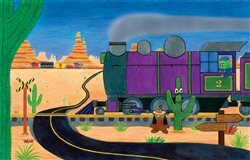 I plan to put the motor at the front of the locomotive. Also, I plan to add two additional wheels on an axle (without the flange) in the space between the current wheels so that this locomotive will have a 0-6-0 configuration. How did you secure the pvc pipe to the ties? Did you consider to make a depression in the tie to keep the tube from rolling when getting pressure on the side? My kids will expect me to build something like this now. Thank goodness for small yards! Looking forward to the updates! Back around 1980 I built a 24" gauge pedal power railroad that ran around our house. Track was 3/4" metal EMT conduit on round side stockade fence crossties. I made a jig for track section assembly on a 3/8"x4'x8' sheet of plywood for straight on one side and curved on the other. I spaced and screwed 2x4 blocks to the plywood to accomodate the EMT rails and wood ties. EMT was surprisingly easy to bend betweeni the blocks. Rails were dropped in first and then the ties on top of them. I then drove self drilling sheet metal screws through what would be the underside of the wood and into the underside of the rail. Then the track section were popped out of the jig and 3/4"x 6" dowel was used as assembling pins. 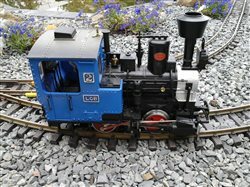 24" track gauge was used so I could climb in the cab of the locomotive which was built on a wheelchair with rubber removed from the wheels. A center pivoted cross pipe was where my feet powered the side rods that went back to an eccentric hub on the wheelchair's "drivers". The engine had an all wood cab, fiber barrel "boiler", copper tube pilot, motorcycle headlamp and battery and i was looking for a smoke machine. I scoured thrift stores for kids wagons to use their wheels (again I removed the rubber) for my rolling stock. All this ran SO well. My favorite experiences were: ------ --running at night through fresh snow. ---when grading and laying track I'd look up at my neighbors' house and see their curtains whisk shut. ---taking kids around the house and occasionally, if their legs were long enough, letting them be the engineer. ---building a new spur with a trestle *** flower trellis. ---building a station with ticket window and a #0 wood stove on a rocking chair base. Sort of like Humphey's tricycle in the old comic strip. ---building a trailer to take the trains and an oval of track to block parties and the Washington DC children's hospital atrium. Aaaah welll... it sure was fun. Today I'm grading with CR-6 gravel for my second G gauge layout. But regarding your project, I hope my jig idea is helpful, i.e. running screws from the underside. If using PVC conduit for curved sections, you would probably have to diagonally cross-brace to keep the rails from returning to straight. Picture wire or aircraft cable with a twist or turnbuckle arrangement, south right rail to north left rail and south left rail to north right rail, under the crossties of course. Even if that worked it sounds like a lot of work just to use plastic. I would seriously contemplate metal instead to hold curvature and gauge. Anyhow best of...no, trial, error, success and never forget to have fun. rixflix aka Captain Video Blessed be Jean Shepherd and all His works!!! Hooray for 1939, the all time movie year!!! I took that ride on the Reading but my Baby caught the Katy and left me a mule to ride. My ride-on train for dogs is done! Beyond cool! I am NOT showing this to my kids! I'd have to build this, too, if I did!